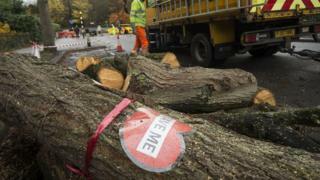 Sheffield City Council is to call a temporary halt to its tree replacement work, the BBC understands. Campaigners say the council has cut down a number of healthy trees among the thousands felled since 2012. The BBC’s Dino Sofos told the Daily Politics show there would be “no felling for the next few weeks” while those involved discussed the issue. The news comes after Environment Secretary Michael Gove said he would do “anything required” to stop the work. Mr Sofos said he understood there would be a pause in the felling during the Easter holidays. “What I’m hearing is, during that period both sides are going to get around the table because [the situation] is unsustainable,” he said. It is understood that work such as pruning will continue during the hiatus but no trees will be cut down.